This museum is a panoramic view showing the visitor what it was like to stand in the center of the city while the attack was in progress. We see one day in the 349-day defense of Sevastopol in 1854-1855. The man responsible for the original museum is Alekseevich Rubo (1856-1928), who was a professor of applied arts, St. Petersburg Academy. The museum was first opened on May 14, 1905. 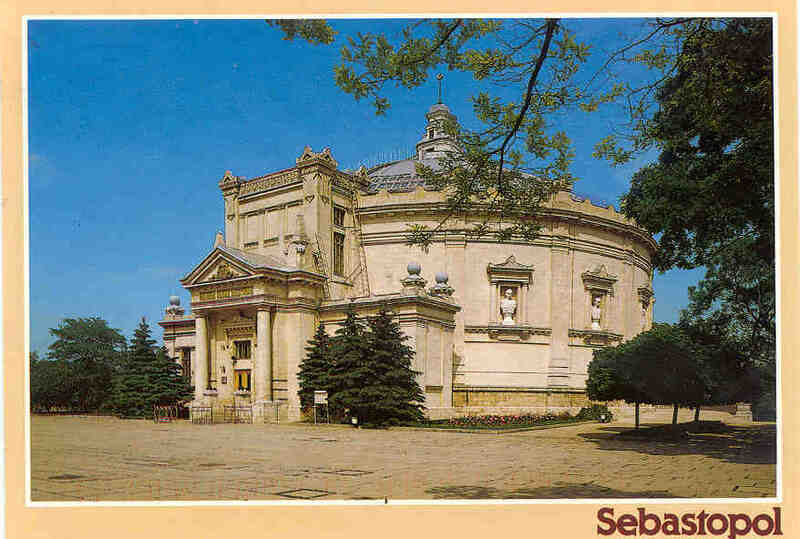 The original round building with a dome, and crown with rotunda, was erected under the project of the military engineer O. I. Enberg and architect V. A. Feldman. The diameter and height of the building are approximately 118 feet each. It is a classical two-column portal, constructed with stone from the nearby Inkerman quarry. The top is decorated by elements of military decor and the number "349", which designates the number of days of the defense. Inside the building was hung a picturesque cloth 377 feet long and 46 feet high. The visitor looked at the scene from a special observation platform, as though the onlooker was at the top of the Malakhov mound. During WWII, the Germans destroyed much of the panorama building. With the painting afire, and risking life and limb, soldiers rescued part of a picturesque cloth from the flaming building. Following WWII, the panorama was reconstructed by the Russian painters. The creative group, consisting of 17 people, was headed in the beginning by the academician V. V. Yakovlev, and after his death by P. P. Sokolov-Skalia. By studying the history of the siege, about which the panorama told, and also reviewing fragments of the picturesque cloth, and of photos and old booklets, the painters recreated the original scene. The intense labor was completed 100 years after the defense of Sevastopol. In 1970, the new Panoramic Museum opened. In 1974 the marble sculptured portraits of the admirals Kornilov, Nakhimov, Istomin, Panfilov, Novosilskiy, captain Butakov, general Hrulev, staff-captain Melnikov, sailors Koshka and Shevchenko, doctor Pirogov, and Russian writer L. N. Tolstoy were added outside of the building. Tolstoy had been an artillery officer in Sevastopol, and has written a fine three-story classic entitled, The Sebastopol Sketches 1. For a look at just a small selection of the marvelous work inside of the museum, click here. Return to the Battlefield Tour.